If you’re in sales, it should come as no shock to you that not every contact will become a lead—and not every lead can become a sale. Depending on your industry, the average conversion rates range from 2% to 10%. Where does your team fall? No matter how many deals your team closes now, you can always improve your sales qualifying questions to target the right customers and convert a higher percentage of prospects. Read the tips below to optimize your sales qualifying questions. What constitutes a great sales question? 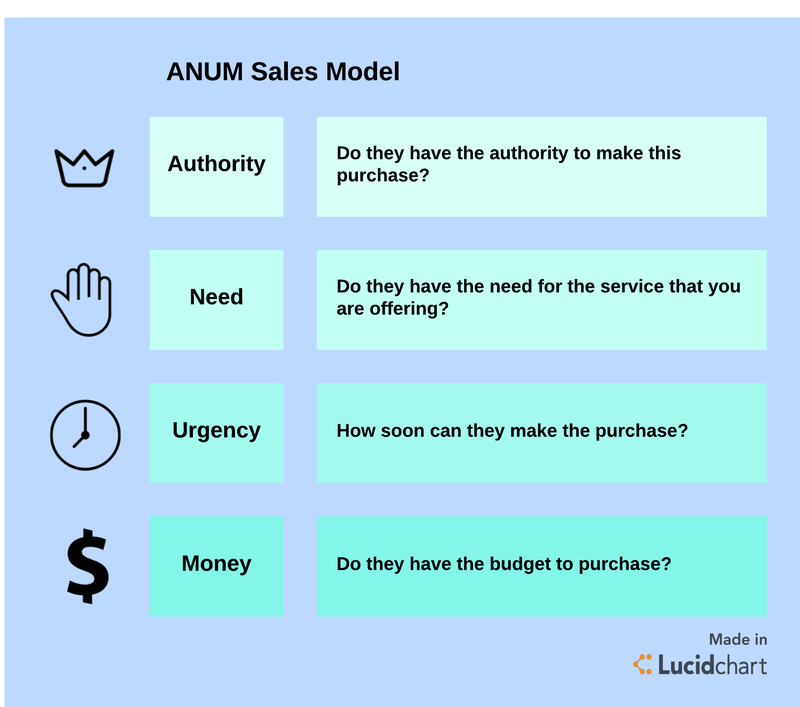 The answer can change drastically for each industry, but ANUM can provide a great baseline for any sales org. Strong lead qualifying questions all need to follow the ANUM order. This is a tried-and-true process throughout the world of sales. Let’s break down each letter and how it will help you generate the best lead-qualifying questions. When you speak with decision makers, they have to trust that you know your product and/or service. In fact, it’s not just about knowing it. You have to be the expert. Learn all the ins and outs of what your company does and the solutions it can provide your prospective clients. They need to look to you the way students look to a college professor or D&D fans view their Dungeon Master (don’t worry if you completely missed that analogy). Make sure your particular product or service suits the needs of your prospect. Even if you could proverbially “sell salt to the sea,” you have to speak to your prospects’ needs. Research their industry. Find out what pain points they experience and how your product or service can solve that pain. This aspect of ANUM works in two ways. First, you need to respond to the company’s requests for information or proposals in a timely fashion. But you should also follow company news (blogs, press releases, social platforms, etc.) to understand the urgent needs this company might be experiencing. For example, if the company just announced that they will expand their workforce by 200 employees over the next year, you want to think about how your product/service can alleviate the common pain points of scaling a company. Obviously, one of your biggest concerns should be where your prospects will get the funds to pay for your product/service. Where’s the money, Lebowski? Maybe you’ve seen interest from a new startup that just received some seed money or an established company that is interested in growth while actualizing an ROI with your product. Bottom line? Before you finalize a prospect, make sure they have the money to spend. Got ANUM memorized? Great. Now take a look at these eight best sales qualifying questions to ask your next prospect. 1. How do you take part in each decision your team/company makes? Before you start any other sales qualifying questions, you have to make sure you’re speaking with the folks who have the power to make the deal. This question determines whether you’re speaking with the right representative. If you’re not, ask your contact to point you in the right direction. 2. What problems are you experiencing? What solutions have you put in place to resolve these problems? The follow-up question is the key—it provides a positioning advantage. If you learn that your competitor is currently signed on with a prospect, you can come in with your differentiating factors. But even better? Your prospect might not even have the solutions you provide yet. This is an open door invitation. 3. Even with solutions you have, what pain points are you still experiencing? Not every newfangled idea works. It only took Oreck to invite a lightweight vacuum that didn’t seal to the carpet—then Dyson had their shot to improve. The reason you ask this question is because many companies might not reveal their solutions’ identity. Or, they might not say if it’s working. Regardless, your whole point is to figure out what your prospect’s biggest issues are. This paves the way to present your solutions as the best. 4. How do you and your team evaluate success? Make the sale a team win. It’s going to be easier for your prospect to make a decision when they know it’ll lead to actual solutions. Not much is better than team accomplishments--especially if the team is experiencing the same pain points. Who knows? This lead qualifying question might help you meet your new case study. 5. In a perfect client-partner relationship, how would you define success (both qualitatively and quantitatively)? Both the client and sales team member need to celebrate wins. It’s crucial for business. It’s crucial for maintaining clients. The best client relationships exist when the client and business grow together. This will show your commitment to the company and that you’re not just trying to land the next big fish. 6. What’s your current budget like for solutions? If you’ve gotten this far in your sales qualifying questions, it’s time to make sure you don’t break the bank. Just kidding. But, in all seriousness, you don’t do what you do for free. That’s why it’s called sales, right? This question allows you to figure out how serious your prospect is. Once money is part of the conversation, you know you’re in business. 7. How do you feel about our solutions? This question lets your prospect give you the most honest answer. From here, it’s either a “yes” or a “maybe.” But don’t give up on the “maybe’s.” Remember, it’s sales: do your best to coach your prospect through the funnel. Remember, you’re selling the relationship--not just the solution. 8. How soon can we help you make this purchase? This question is the true closer. If your prospect is serious, they’ll let you know immediately or give you a definitive timeline. Either way, this is one of the most accurate lead-qualifying questions you can ask a prospect. It gives a window that provides pure transparency. You’ll find out whether they’re ready to make the deal now, will be ready very soon, or are saving up for a rainy day. Bottom line? Never forget a prospect. Always continue to follow up, even if you didn’t land the sale immediately. Discover how Lucidchart can help you map out your sales qualifying questions. Sign up for your free account today!